The Samsung Galaxy Tab onscreen keyboard has a plethora of keys that are not readily visible. When the keyboard first appears, it is in Alphabetic mode and you see keys from A through Z in lowercase. You also see a Shift key for producing capital letters, and a Delete key, which works to backspace and erase. But, you’re not limited to typing only the symbols you see on the alphabetic keyboard. The Galaxy Tab onscreen keyboard has many more symbols available, which you can see by touching the 123 key. Touching this key gives you access to three additional Samsung onscreen keyboard layouts. 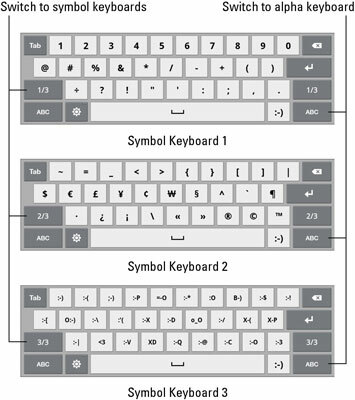 Touch the 1/3, 2/3, or 3/3 key to switch between various symbol keyboards. When you are ready to return to the standard “alpha” keyboard, just touch the ABC key. You can access special character keys from the main alphabetic keyboard, providing you know a secret: Long-press (touch and hold) a key. When you do, you see a pop-up palette of additional characters. Choose a character from the pop-up palette or touch the X button to close the pop-up palette. Not every character has a special pop-up palette.